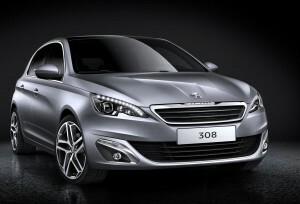 These are the first official images for the new Peugeot 308, the firm’s completely new compact family hatchback. The Peugeot 308 looks distinctly like its stable mates and has a radical new cockpit-style cabin featuring premium materials, exceptional build quality and a clean ‘button-less’ interior. There’s also a range of highly efficient petrol and diesel engines for the family car with class-leading emissions from as low as 85g/km – helped by the company’s new EMP2 modular platform which has led to a weight saving of 140kg. The 308 is launching into the competitive compact car sector and the firm is hoping that its striking and contemporary design will win new fans. Peugeot’s design and engineering teams have developed the interior of the new Peugeot 308 around the concept of the i-cockpit – everything is arranged for an experience that is intuitive, relaxing the driver to focus entirely on the road ahead. The highlight of the Peugeot 308’s generously spaced cabin is the 9.7-inch touch-screen interface, which removes much of the need for physical buttons and switches. Setting a new size standard for the class, it brings together many of the infotainment controls in one place, for ease of use and to create a contemporary and uncluttered cabin. Breakthrough engineering has also allowed many of the Peugeot 308’s major units to be reduced in size – also cutting overall weight – leading to significant reductions in CO2 emissions. As a result, this new Peugeot 308 establishes an environmental benchmark. The new Peugeot 308 is the latest evidence of the brand’s move up-market, an initiative started several years ago and seen most recently with the 208 and 2008. The compact family hatchback will make its world debut at the Frankfurt Motor Show on 10th September, when more information about this innovative new model will be released. Sales will start shortly afterwards in mainland Europe and from January 2014 in the UK. It looks like an impressive car and feedback has been positive so far but I’m guessing that the leasing costs for the new Peugeot 308 will make owning one the cheapest option. This entry was posted in Car Updates & Releases, Eco Car, Family Car, New Cars and tagged 308, Compact Family Car, Diesel 308, family car, lease the Peugeot 308, Petrol 308, peugeot, Peugeot 308, Peugeot 308 Emissions, Peugeot 308 Hatchback, Peugeot 308 Release Date, Peugeot Car Leasing, Peugeot Family Car by Steve Lumley. Bookmark the permalink. Peugeot just need to start working on a duel clutch gearbox..then i will be first in line in ordering my new 2014 peugeot 308..
Here’s the link: free prize draw to win a New 308 model at http://mzs.es/ec308 on this blog.